200 feet above Rainey Street, the traffic on I-35 doesn’t seem quite as bad. Almost tranquil even. 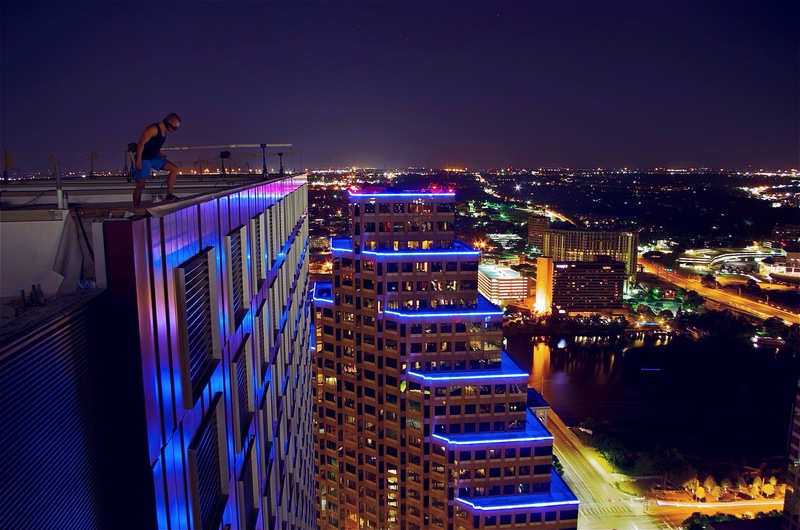 I am following one of Austin’s most daring rooftop photographers as he makes his way across the roof of a Rainey Street highrise. This image was captured solo using a tripod with a 15 second exposure. On the unfinished JW Marriott looking westward. “You’d be surprised at how easy it is to get into some of these buildings,” says j_type in his first interview. J asked that I use his online pseudonym to avoid unwanted attention. An almost native, Austinite j_type has been in Austin for over 20 years now, arriving when he was only four years old. The downtown skyline has changed dramatically since the mid 1990s. “Our downtown really started to develop its own character when the Frost Tower went up in ’03,” explained J.
J’s photography has an otherworldly appeal. The photos look like they were captured in a futuristic setting. 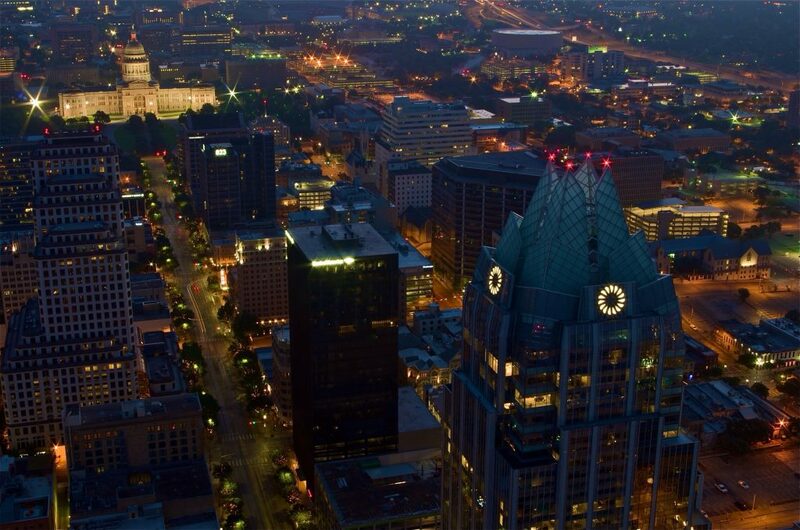 The tallest building in Austin upon its completion, Frost Tower has since been eclipsed by the 360 Condominiums and the Austonian. 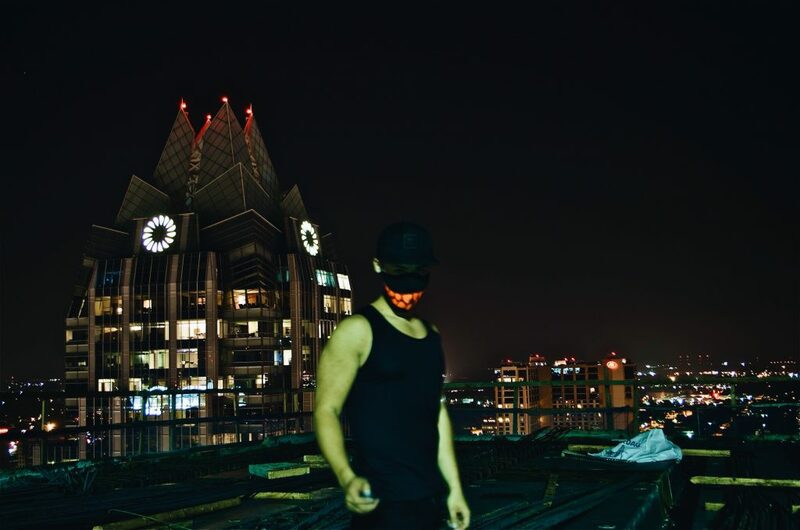 At nearly 700 feet tall and holding the record for the tallest all-residential building West of the Mississippi, the Austonian holds a particular allure for J and is the site of his most captivating shots of our fair city. There are currently more than a dozen tower cranes in Austin. Four years ago, as the Austonian was opening its doors, there were barely that many in the entire state of Texas. 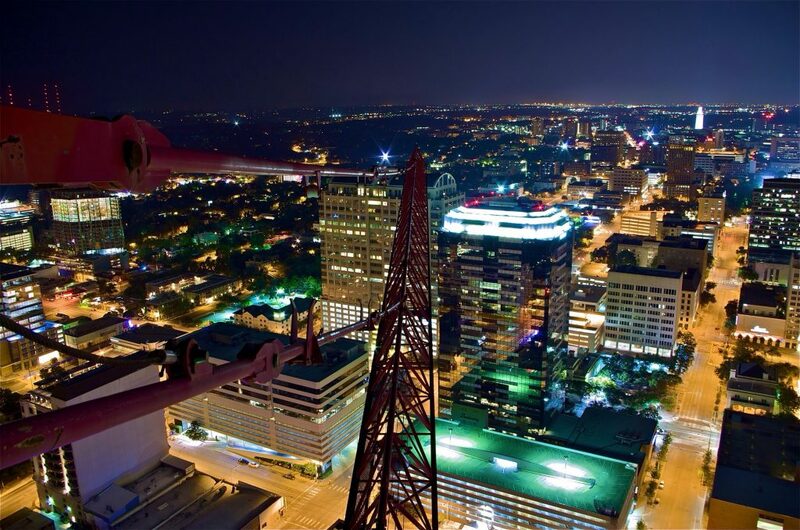 Business is booming, as they say, and there is no better time than the present to be a rooftop photographer in Austin. 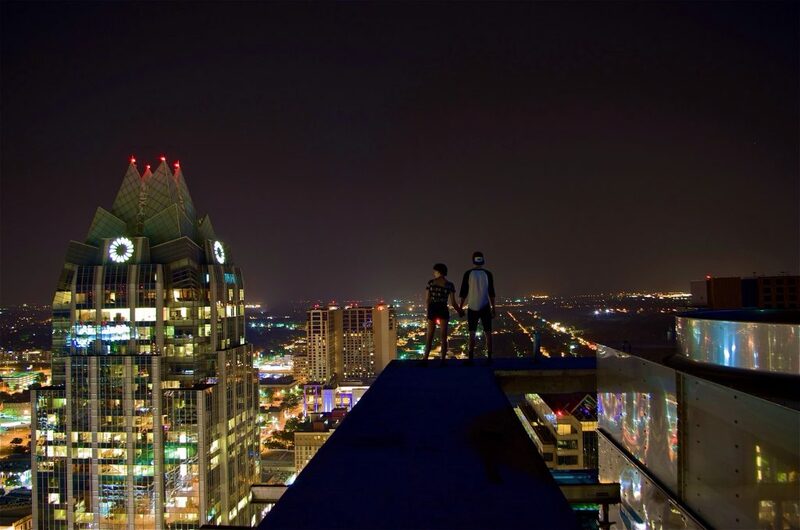 The Austin skyline has been photographed from just about every angle imaginable (we feature some of the best on our own Facebook page), but the images J captures stand out and offer a truly unique perspective. “One of the many magical things about cranes is that they are temporary and only there for a short time while the building is constructed. I’m glad I was able to capture images from these locations, as they will never be able to be captured again,” says J.
J was kind enough to share a few of his best shots captured from some of Austin’s most iconic buildings, as well as a few from unfinished towers like the massive JW Marriot. On the scene during one of J’s shooting sessions. Most of J’s shooting sessions occur between 2am-6am. The photos are taken with a Pentax K30 using an 18-55mm lens. The camera is on an old 80’s era tripod with 20-30 second exposures. I asked him if there had been any close calls. 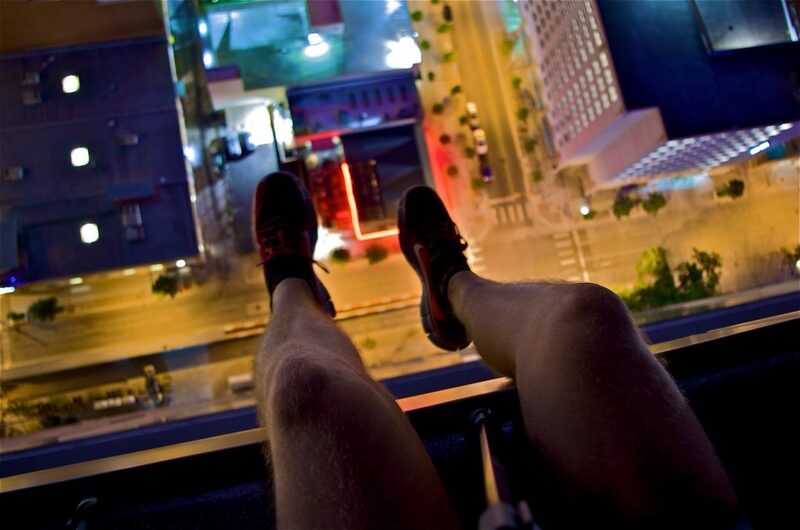 “We had a helicopter fly near a crane we were climbing and I almost fell off trying to scramble out of there. I didn’t even wait to see if it was a Police chopper,” shared j_type. You have to know the building layouts and the type of crane you are climbing. J goes out with a few other dare devil friends during some of his shooting sessions. “Some of those guys have a death wish though; I try to be careful,” says j_type. 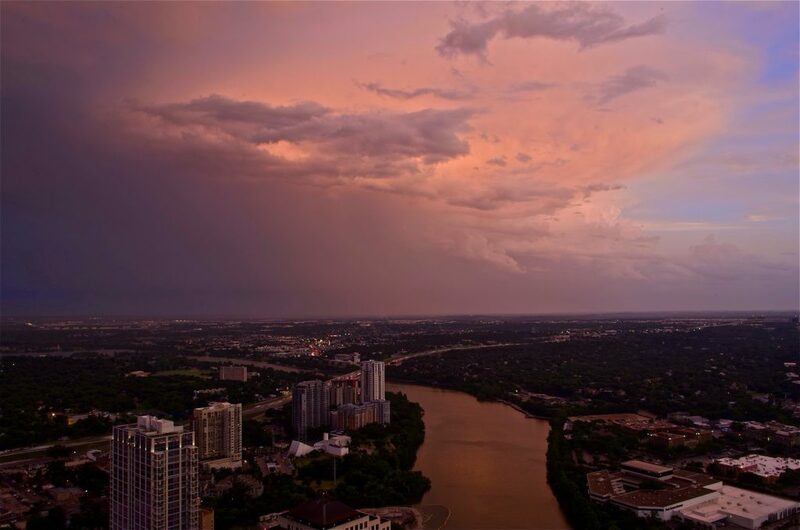 Some of the most spectacular Hill Country sunsets have been captured from the top of the Austonian. “You have to try and stay incognito as you are scaling these buildings,” remarks J. The mask helps with the winds high above Austin. 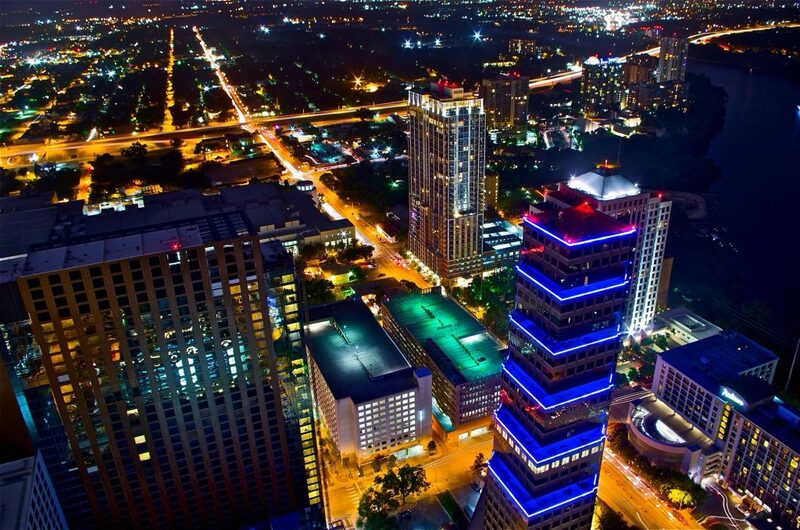 What are the best spots in Austin to take skyline photos?